The sale of a bit of government-owned oil producer Saudi Aramco could mark the first in a series of spinoffs and privatisations by Riyadh. Offloading these assets while oil prices are low makes sense both economically and politically. It would help the kingdom to endure oil prices hovering around $30 per barrel until the end of the decade, without it having to significantly cut back on spending or drain its sovereign wealth fund coffers. That’s especially important when the kingdom is locked in a costly and increasingly bitter regional power struggle with Iran. With access to 266 billion barrels of crude oil and daily production running at around 10 million barrels of crude, Saudi Aramco could bring in billions of dollars of revenue if the government decides to list some of its shares on the Saudi Stock Exchange. A sale could also open the floodgates for the government to offload some of the $170 billion worth of shares it owns in companies already listed on the exchange. Releasing more of its equity from blue-chip Saudi companies could also help to attract fresh capital inflows to the country’s main stock market, which has sagged over the last year along with falling energy prices. The Tadawul All-Share Index has fallen 27 percent since last January despite the market being opened up for the first time to foreign investors. They may have been scared off by the volatile politics of the region and the collapsing value of crude. Aside from releasing more equity in companies such as petrochemicals giant Saudi Basic Industries Corp, Saudi Electricity Company and National Commercial Bank, the government could also look at offloading its sizeable land bank in major cities such as Riyadh and Jeddah. Little is known about the exact value of the government’s real-estate and property holdings, but these assets are also understood to be worth billions of dollars. The kingdom ran a budget deficit equal to 15 percent of gross domestic product last year and modest spending cuts are unlikely to reduce that gap significantly in 2016 without other revenue-raising measures. A garage sale of its main company assets would buy Riyadh more time to win the oil price war that many of its policymakers see as vital to its long-term future. 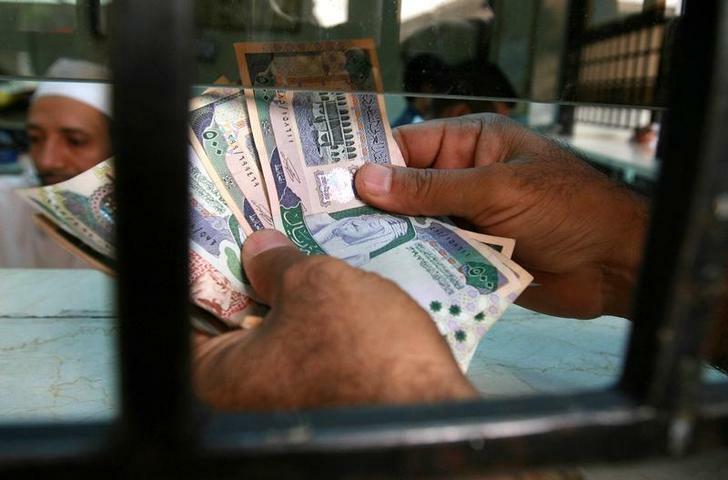 A Saudi money exchanger counts Saudi riyals in Riyadh. Saudi Aramco – the world’s largest national oil company – said on Jan. 8 that it was studying various options to list its shares for the first time on capital markets. The company was prompted into the statement following publication of an Economist interview with the Deputy Crown Prince Mohammed bin Salman, in which the son of Saudi Arabia’s king said that he had held meetings about a possible IPO. The company’s Chairman Khalid al-Falih told The Wall Street Journal in an interview published on Jan. 11 that a listing could include its main oil-producing assets, and not just its less valuable downstream refining joint ventures.